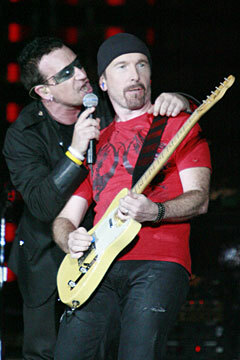 Bono and The Edge performed to a crowd of 47,000 Saturday night at Aloha Stadium. Honolulu was stop No. 131 on the band's Vertigo tour, the final concert of the world tour. Slovenia, Ireland, England, Arkansas ..."
They came from all over, avid fans of a certain band that was wrapping up its world tour Saturday at Aloha Stadium. A guy was telling his friends of the people he'd met from such faraway locales, as a long line of ticketholders finally made it inside to experience the near-evangelical power that is U2 in concert. True believers all, some of them wore THE GAP (Product) Red T-shirts that are part of lead singer Bono's consumer campaign to help finance the fight against AIDS and extreme poverty, particularly in Africa -- shirts with "INSPI(RED)" and "DESI(RED)" stenciled on them. But in the true rock 'n' roll spirit, others wore more amusing tshirts from the line that read "HAMME(RED)," and "BO(RED)." 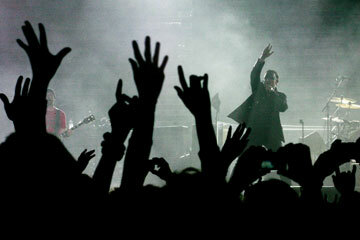 Regardless of their attitudes, fans filled the stadium to capacity to eagerly attend the Church of U2. As Bono mentioned early on, it was "a gathering of the faithful," and the "congregation," at times, literally shook the venue's rusting stands in gleeful approval. Somewhere in all that humanity, according to stadium spokesman Patrick Leonard, were special guests Microsoft Chairman Bill Gates and celebrities Pierce Brosnan, Kid Rock and cast members of the ABC show "Lost." The singer also thanked the crowd for being patient and having faith in the band. That faith was rewarded several times over the course of the evening. To celebrate the end of the tour, all the tour dates were scrolled across the giant video projection screen behind the band on stage, and the crowd roared as "131. Honolulu" went by. With that, guitarist The Edge launched into the opening song, "City of Blinding Lights," as Bono strode out holding up the Stars and Stripes. The entire stage blossomed into a dazzling array of synchronous lights. Combined with the high-definition video screens set atop flanking banks of speakers emitting a clean and clear mix of music, the technical sophistication on display showed why U2's shows are considered the best around. The band's set and two encores were filled with songs that have been staples on this last Pacific Rim leg of the world tour. After the powerful trifecta of "City," "Vertigo" and "Elevation," U2 delighted veteran fans with a ringing rendition of the band's very first '80s hit, "I Will Follow." Two semi-circular ramps extended into the audience. At times, the band members (including the always-dashing rhythm duo of Adam Clayton and Larry Mullen Jr.) would walk down the ramps to join the crowd on the stadium field, proof of U2's intimate rapport with fans. AS is USUAL with the band's concerts, individual fans were invited on stage. One lucky guy took it to another level by confidently sitting at The Edge's keyboard setup playing with the band through an impromptu read-through of the rarely played "Who's Gonna Ride Your Wild Horses." At song's end, the guy ran across the stage and down the stage-right ramp, pausing briefly to raise his arms in triumph before leaping with joy back into the crowd. Things then got a bit quieter, starting with an acoustic rendition of "The First Time." The audience was reminded of how fine a singer Bono is, and he received cheers and spontaneous applause for his powerful delivery on "Sometimes You Can't Make It on Your Own," a tribute to his late father, and "Miss Sarajevo." On that song, he negotiated his way around Luciano Pavarotti's original operatic tenor part very well. 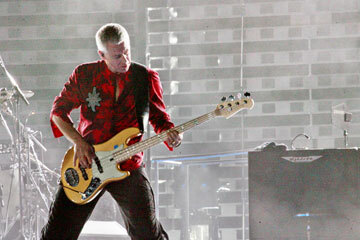 Bassist Adam Clayton lays down the foundation. He and drummer Larry Mullen Jr. made frequent forays down the ramps into the crowd. With the prompting of Bono, U2 has been able to balance its Christian-based spirituality and more secular, sociopolitical concerns. The latter was highlighted by the one-two punch of "Sunday Bloody Sunday" and "Bullet the Blue Sky." Bono exhorted the crowd to honor the faiths of Islam, Judaism and Christianity, their symbols helping spell out the word "coexist," blazoned in red behind him. With Bono being a longtime supporter of Amnesty International, the articles of the Universal Declaration of Human Rights scrolled on the screen during a hearty version of "Pride (In the Name of Love)," the hit written in memory of civil rights activist Martin Luther King Jr. "Pride" originated during the band's first Hawaii visit way back in 1983. U2 would encore twice: first with added visual dazzle on "The Fly" and "Mysterious Ways," then stark and somber in a moving "With or Without You." Then came an end-of-tour treat: After performing a new single, "Window in the Skies," Green Day's Billie Joe Armstrong came out to join the band on "The Saints are Coming," a song the two bands performed on the special occasion of the New Orleans Saints' return to the Louisiana Superdome in their devastated city. And after that, Eddie Vedder and Mike McCready of Pearl Jam -- who had already played a well-received opening set -- returned to the stage for a revised rendition of Neil Young's "Rockin' in the Free World," complete with a new set of lyrics that furthered the bands' common cause to end extreme poverty. But U2 would have the last word, or song, as it were, as the night's festivities ended on a gentle note. At the end of "All I Want is You," Mullen was left the last person on stage. He thanked the crowd before he, too, exited. And with that, the crowd dispersed into the night, later to their homes and regular lives, whether those be here, Slovenia, Ireland, England or Arkansas. 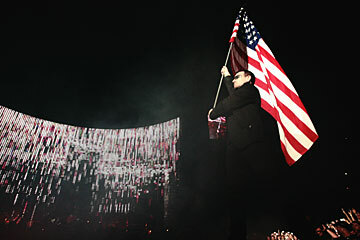 Bono opened the concert carrying a U.S. flag onstage in a sweep of red, white and blue, as guitarist The Edge launched the opening song, "City of Blinding Lights." » In the review of the U2 concert Monday, reference was made on Page D5 to the "amusing, sarcastic knockoffs" of the T-shirt line by The Gap (Product) Red. Tania Kingsrud of BNC, the public relations firm for the (Product) Red line, said that those T-shirts with "HAMME(RED)" and "BO(RED)" are also part of the special clothing line.